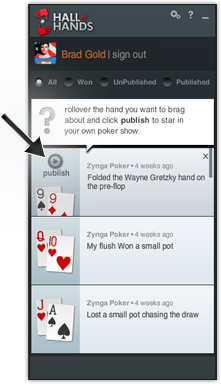 With the Hall of Hands Studio you can select any hand played, publish and share your poker shows on your Facebook wall. Rollover the hand you want to brag about and simply click "Publish". 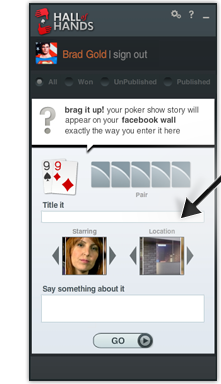 Add a title to your poker show and say something about your hand. Click "GO"to publish your hand. An email notification will be sent to you when your poker TV show is ready for viewing and published on your Facebook wall. You'll be bragging with your poker show in few moments.